You can use this tool to remove McAfee. Note: If you still have HJT on your desktop you can skip number 1 and go to number 2. 1. Please download: HiJackThis to your Desktop. 2. Double Click the HijackThis icon, located on your Desktop. Please run RootRepeal even if HJT doesn't run for you. I ran the McAfee Consumer products Removal Tool and all the old McAfee files are gone (I scanned my system as a check). Though there is a new McAffee file, McAfee.xml (in C:\Program Files\common Files\the shield deluxe\Setup Info\(alpha numeric code)\extern), from my re-installation of The Shield Deluxe antivirus checker (see next paragraph) that is part of that install. I took a big detour in order to run the programs you requested in your last post. I had to re-install the Shield Deluxe (I now have the 2011 version) because I forgot my password that is needed in order to disable the checker in order to run RootRepeal--really stupid mistake on my part losing my password. I latter found the password buried in my notes. It was lucky I found my password because the re-install of Shield Deluxe still insisted on my password to change any settings. By the way, I decided to password protect the Shield Deluxe antivirus setting because I think something (not me) changed only one of the settings, the real time protection, without my knowledge while the other settings were left alone (when I disable my virus checker I turn off all settings). I tried to run HiJackThis as you requested in your last post. I could not get it to run on my system. When I tried to run it I got a window that said "C:\Documents & Settings\User\Desktop\HiJackThisInstaller.exe is not a valid win32 application". I tried to run RootRepeal, as you requested in your last post, after I turned off my Windows Firewall and the Shield Deluxe anti-virus checker. I could not get it to run on my system. When I tried to run it I got a pop-up window from the Shield Deluxe that said "RootRepeal has been terminated by Active Virus Control". I turned off all the product settings on the preferences window of the Shield Deluxe in preparation for the RootRepeal run. I must not be missing something somewhere and I didn't see the Shield Deluxe listed in your link to methods to disable programs. I ran the ESET OnlineScanner and no threats were found. It took about four hours to scan my system's seventy thousand files. My observations of my current system status: my system does not have the redirect problem and I have sound thanks to your directions to remedy those problems. However, I think I still have some less serious issues regarding connection. During the mid-afternoon portion of the day (between about 2pm and 5pm) and mid-evening (about 7pm to 9pm) I have problems connecting to the Internet or, while on the Internet during those time periods, my system is so slow it seems as though my machine has locked up. I think this might be a problem with the Internet service provider (Earthlink) because my wife's computer, with whom I share that service via a wireless connection, has a similar problem but her's is not as severe. Also, I think some of my connection problem might be caused by my wireless network connection (Trendnet to Linksys router) since the signal strength changes occasionally; the signal strength is not steady since it changes from excellent or good to average on occasion. Additionally, I think an icon in the system tray on my computer is indicating intermittent or loss of wireless network connection when the wave symbol, that normally lights up periodically (white color to green color) next to the monitor symbol, either freezes in the on position (green light) or fails to light (white color). Any suggestions? What do I do next? I'm interested in making sure all viruses and malware have been removed from my system. I do appreciate all your help; my improved Internet experience due to your help has allowed me to explore and navigate all the health care options for my ailing father and mother in-law. Again, thank you. Click Go and copy/paste the log (Result.txt) into your next post. .
# Interface IP Configuration for "Local Area Connection"
# Interface IP Configuration for "Wireless Network Connection 11"
Description: Unable to Connect: Windows is unable to connect to the automatic updates service and therefore cannot download and install updates according to the set schedule. Windows will continue to try to establish a connection. The signal is going through but, like you said, it is intermittent. Have you tried hardwiring your computer to the modem? It would appear to be a problem with the wireless. Also, please reset your modem and router. Unplug them for a minute. With a hardwire connecting my computer to the router located at my wife's computer, I have a good Internet connection. My wife reset the router (pushed the button and unplugged the unit) and disconnected the modem (turned it off at the switch as well as unplugged the unit). It was a lot of work to follow the instructions to get the router, that is wired directly to my wife's system, back up and running but she was finally able to accomplish the task and she has her Internet phone and Internet connection back. There was a side benefit of all this work: we found and properly filed our computer system literature and found some other missing items as well! My system required more work and was not entirely successful. My wireless Internet connection is worse since the router/modem reset and my reinstalling the wireless software & adapter. After the resetting the modem and router, I could not hookup my system to the Internet (my system: Trendnet wireless USB adapter [TEW-424UB] to Linksys router [Wireless-G Broadband Router--mdl. WRT54G2]). After checking on the Trendnet status, I reentered the security key and was able to get some activity on that device (searching to establish a connection with the router) but still no connection. I decided to reinstall the Trendnet software on my computer. Immediately after reinstalling, I got fifteen minutes of uninterrupted, though slow, Internet connection until I was disconnected. I could only continue intermittent connection by repairing the connection (by clicking on the icon in the system tray to pop-up a window for that device and then clicking on "Repair"). I had to do this continually to receive about a minute or two of connection. I kept an eye on the signal strength during this phase of the problem and noticed that it would go from a good connection (multi-bar green) to weak connection (single bar red) back to fair connection (no bar) back to good connection and so forth. The Internet connection was slow during this time frame (for a minute or two) until I loss the connection entirely (red "X"). I have not had this condition in the past. Before the router/modem reset and my reinstalling the Trendnet software and adapter, I would routinely get periods of no connection to connection periods of an hour or two. Things have gone downhill in regard to wireless connectivity. By the way, I wonder if the wireless connection is having problems due to the building structure where I live. My place is a small townhouse and has concrete party walls (the wall between units) with wood framing in the interior of the unit. The router is located about twenty five feet away from my computer and is in another room. Again, the hardwire connection between my computer and the router is working very well and the Google redirect problem has been solved due to your direction. I have an uninterrupted Internet connection with the hardwire. I'm not sure if my wireless Internet connection problem is a virus\malware issue; perhaps I should start a new post? If so, please advise if I should uninstall the various anti virus software packages that I have installed on my system at your direction. Please include any tips on making the uninstalls successful. Thank you for your help to date. From what you described to me, it would appear that the problem is with the router sending the signal or the receiver. Unfortunately, I can't help you with this. You could start another thread in another forum. Perhaps that may help. 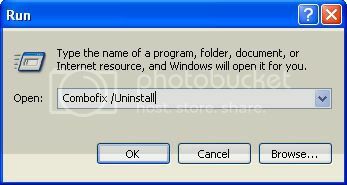 I successfully completed the uninstall of ComboFix. I don't have OTL.exe on my system; it must have been removed by my running my anti-virus during this Google redirect problem process (see my reply #12, August 10--I shouldn't have done that as you mention in your introductory instructions). Do I delete or try to uninstall the following programs that are on my desktop that I downloaded at your direction? I want to make sure I don't accidentally run these programs again. To delete I should double right click on the icon and left click on delete in that window? If I need to uninstall any of these programs, please provide instructions. "I re-enabled my Deluxe Shield as well as my PC Tools Spyware Doctor antivirus checkers and ran them after the ComboFix scan. I'm not sure I did a good thing. The PC Tools Spyware caught a lot of items, though did not defined what items it caught, and fixed those files and the system does not run better." Do I delete or try to uninstall the following programs that are on my desktop that I downloaded at your direction? Yes. If the programs are installed on your desktop, simply delete them or drag them to your Recycling bin. If not installed on your desktop, uninstall them. Support-LogMeInRescue.exe is not one of the programs I asked you to install. You may keep SAS and MBAM, if you wish. Update them and run them on a regular basis. All the others can go. I got the other programs off my system per your direction. My system is running very well--thank you. Sorry about the "Support-LogMeIn" program citing. That was the Shield Deluxe anti-virus personnel log-in to help me install their new 2011 program after I thought I lost my password for the 2010 edition. That was a big mess and totally my fault. I now take better care of my passwords. I think I have one last question. To prevent the loss of my files on the hard drive, I saved some of my files (personal files and not programs I think) on thumb drives (two or three thumb drives up to 1GB capacity each) prior to all your work on my system. I want to know if I can reuse those thumb drives without jeopardizing my system? In other words, can I can plug those thumb drives back into my system, delete the contents, and reuse the thumb drives? I thought I should be safe rather than sorry and ask you before I do this. In other words, can I can plug those thumb drives back into my system, delete the contents, and reuse the thumb drives? I thought I should be safe rather than sorry and ask you before I do this. Yes. When you plug in the thumb drives hold the Shift key down for about 10 secs. while inserting them in the USB drive. Then, scan them with your AV and also with SAS and MBAM to be sure that they're clean.